What makes a gourmet cupcake recipe so special? I'd guess that it's the top rate ingredients that separate this easy cupcake recipe from the rest of the pack! First appearing in an 1999 issue of Gourmet Magazine, this mini brownie cupcake recipe won over readers and earned a rating of 4 stars! That's quite an achievement. So before you run out to your neighborhood cupcake bakery and lay $3.50 down on the serving counter for your favorite gourmet cupcake, try whipping up a batch of these! I don't think you'll be disappointed! Enjoy! 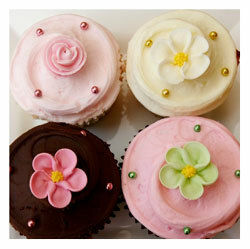 If you've got your own favorite gourmet cupcake recipe, send it in and become part of our baking community! We'd love to hear from you! Preheat oven to 350°F and line enough mini-cupcake tins for 72 cupcakes with paper liners . Melt butter and chocolate in a 4-quart heavy pot over moderately low heat, stirring until smooth. Whisk together flour, cocoa, and salt. Remove pan from heat and whisk in granulated sugar. Add eggs, 1 at a time, whisking after each addition until incorporated, and stir in flour mixture just until blended. Spoon batter into muffin liners, filling cups to top, and bake in middle of oven 15 to 20 minutes, or until a tester comes out with crumbs adhering. Cool 5 minutes in tins and turn out onto racks. Repeat with remaining batter. Dust with confectioners sugar if desired. This recipe makes 72 mini cupcakes and is great for special occasions!